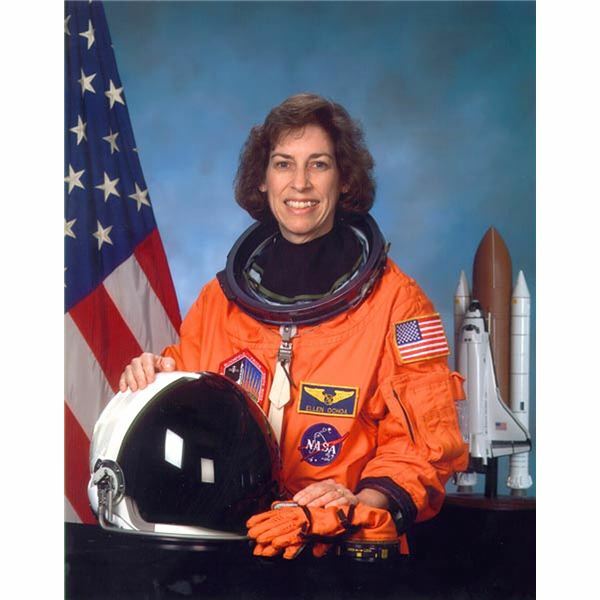 Learn Ellen Ochoa Facts: Our First Hispanic American Woman in Space! Ellen Ochoa will go down in history as the first Hispanic American woman to travel in space. She served on a nine-day mission aboard the shuttle Discovery in 1993, where she studied about the earth's ozone layer. This is an achievement that she has the right to be enormously proud of. Although Ellen is now considered a former astronaut, she is still very much involved in the space program and is currently Deputy Director of the Johnson Space Center, where she manages and directs the Astronaut Office and Aircraft Operations. Ochoa was born on May 10, 1958 in Los Angeles, California, but grew up in La Mesa, California. As a child, she was very interested in music, math, and science. She received a Bachelor of Science degree in physics from San Diego State University and after obtaining this she considered starting a career as a classical flutist or going into business. At the urging of her mother, she decided to instead enter graduate school, where she obtained a Master of Science degree and doctorate in electrical engineering from Stanford University. Sally Ride became the first female U.S. astronaut, and her achievements inspired Ellen Ochoa to aim high as well. After gaining her doctorate she applied to NASA in hopes of also becoming an astronaut. NASA accepted Ochoa into their astronaut training program in January of 1990 and she officially became an astronaut in July of 1991. NASA was very interested in Ochoa because of her expertise in optics and computer hardware. They believed that her knowledge could help design systems to improve data gathering, as well as assess the integrity and safety of the equipment. Less than two years after becoming an astronaut, Ellen was chosen to fly on a Discovery Space Shuttle Mission as a Mission Specialist. She had a very successful career, logging in an impressive amount of nearly 1,000 hours in space. She was a mission specialist on STS-56 in 1993, a payload commander on STS-66 in 1994, and was a mission specialist and flight engineer on STS-96 and STS-110 in 2002. Not only was she qualified to have been a part of four successful space missions, but she was also a successful inventor. She is listed as a co-inventor of three patents which include an optical inspection system, an optical object recognition method, and a method for noise removal in images. Ochoa's pre-doctoral work at Stanford University in electrical engineering helped her devise and invent the optical system that is designed to detect imperfections in repeating patterns. Ellen Ochoa is an inspiration, not only to Hispanic Americans, but to all women in general. She is a great role model for women who believe that they have the power to change their lives and make a difference in this world. Ellen received many awards for all her hard work as an astronaut and engineer, and the world will never forget its first Hispanic American woman to travel into space.